My job has needed me to put in extra hours for an 8 week duration. This makes coming up with meals that are quick AND tasty even more important. Pasta is often my “go to” player in my menu selections. It’s versatile and like a “little black dress” you can dress it up or down. Today’s dish falls somewhere in the middle. and is ready in about 30 minutes. I use frozen green peas because “some people” in my house don’t care for sugar snap peas (which I absolutely love). Oh well…..can’t win them all. While you wait for the water to heat… defrost your grilled chicken pieces, shred your cabbage, slice the pepper, chop the cashews and cilantro, then peel and trim the garlic. Get your other ingredients out and on the counter. The saute comes together pretty quick. In the time it takes to cook the pasta, you will have the saute done and ready to add it all together. Heat a large skillet or wok if you have one, add the oils and saute the garlic and fresh ginger( if using) barely a minute. 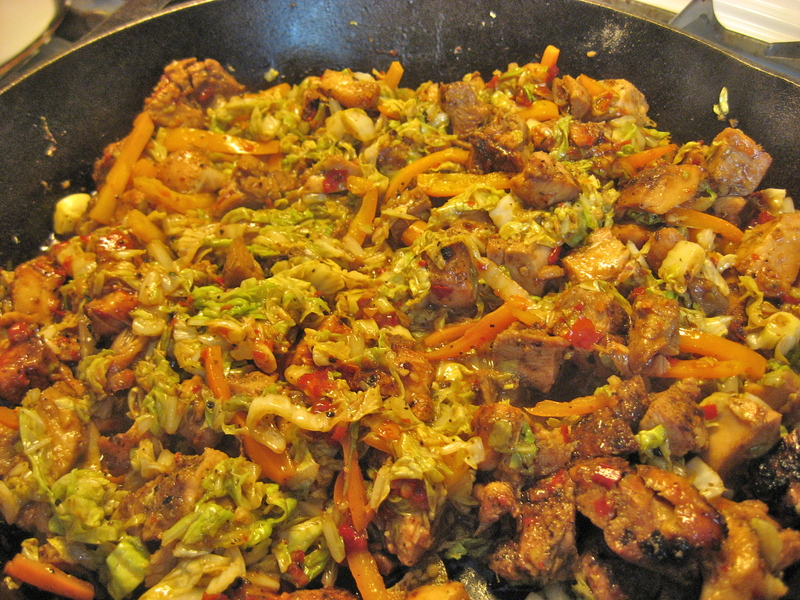 Add the cabbage, pepper, and snap peas(if using) and saute about 3 minutes. Add ground ginger (if using) at this time. Stir and then add grilled chicken, soy sauce, and both chili sauces. Cook about 2-4 minutes longer until cabbage has collapsed. Turn off heat. Add saute mix to pasta, sprinkle on cilantro and mix everything together. 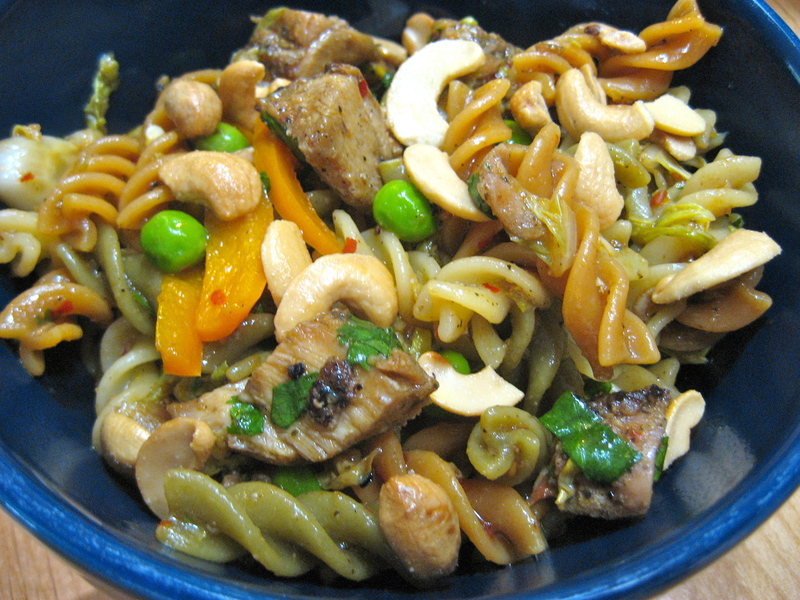 Serve with chopped cashews on top. Enjoy!